Anya Gallaccio (born 1963) is a Scottish artist, who often works with organic matter. Born in Paisley, Scotland to TV producer George Gallaccio and actress Maureen Morris, she studied at Kingston Polytechnic and Goldsmiths College. In 1988—the year she graduated from Goldsmiths—she exhibited in theDamien Hirst-curated Freeze exhibition, and in 1990 the Henry Bond and Sarah Lucas organized East Country Yard shows, which brought together many of the Young British Artists. Gallaccio is a Professor in the Department of Visual Arts at the University of California, San Diego (UCSD). 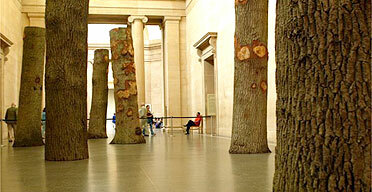 She was a nominee in the 2003 Turner Prize. Much of her work uses organic materials, with fruit, vegetables and flowers all featuring in her work. Sometimes these materials undergo a change during the course their being exhibited. In Red on Green (1992), ten thousand rose heads placed on a bed of their stalks gradually withered as the exhibition went on.For Intensities and Surfaces (1996) Gallaccio left a thirty two ton block of ice with a salt core in the disused pump station at Wapping and allowed it to melt. Other works by Gallaccio include Stroke (1993) in which benches in the gallery and cardboard panels attached to the walls were covered in chocolate and Because Nothing has Changed (2000), a bronze sculpture of a tree adorned with porcelain apples. 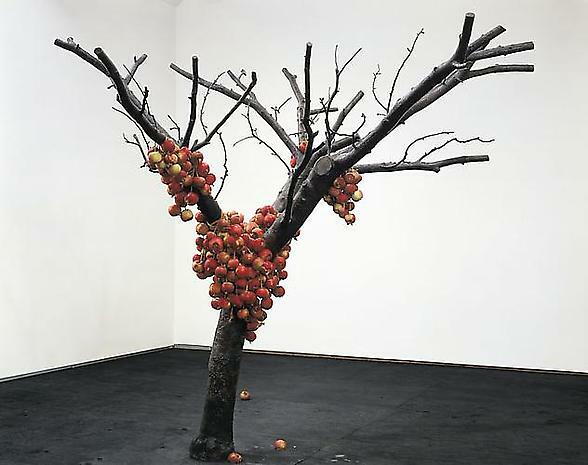 Because I Could Not Stop (2002) is a similar bronze tree but with real apples which are left to rot. At Houghton Hall in Norfolk, the Marquess of Cholmondeley commissioned a folly to the east of the great house. "The Sybil Hedge" is an "artlandish" folly. It is based on the signature of the marquis' grandmother, Sybil Sassoon. Gallaccio has created a sarcophagus-like marble structure which is sited at the end of a path; and nearby is a copper-beech hedge which is planted in lines mirroring Sybil’s signature. 2005 saw the publication of Anya Gallaccio: Silver Seed by Ridinghouse, which accompanied the artist's exhibition commissioned by the Mount Stuart Trust for an installation at Mount Stuart on the Isle of Bute, Scotland. I came across Anya Gallaccio's work recently and can't help but be drawn to it's beauty and use of natural materials. Her work tends to bring natural elements into an unnatural environment to be admired which I find quite interesting as installation work. Her work tends to deal with the theme of life and death in her pieces especially 'Red on Green' in which the flowers eventually withered and died which concluded the piece as an exhibit. Which gives her work the physical presence of the passage of time in a space for viewers to see. I also liked her range of materials since she has also used trees or parts of them and included other materials with them as part of the pieces. Her work luckily was showing at the McManus gallery as a surprise to me as well as maily other British artists who have used the natural world in their art. It gave a lot of inspiration to working within this type of theme since I've not worked with the natural world before creatively.